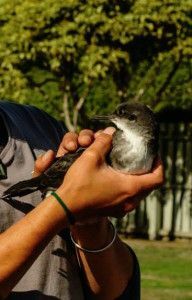 Crash landings or ‘fallout’ (term used in scientific literature) of Hutton’s shearwaters occur in and around Kaikoura during the breeding season (September to April) when birds fly from their mountain colonies to the sea. These flights take place at night and birds can become disorientated by the artificial light spill of the Kaikoura settlement which lies within their flight path. Often compounded by poor visibility weather conditions, birds mistake the lights for navigational cues and end up colliding with lamp or power poles and lines or just land prematurely within or around the township instead of the sea, predominantly along Kaikoura’s coastal roads (e.g., Beach Rd and The Esplanade). From September to February (during egg laying, incubating and chick rearing), what you will find are adult breeding birds which are essential to the survival of their chick. A single parent will not be able to raise a chick alone if the partner has died. Being experienced flyers, crash landings of adult birds usually occur infrequently and in low numbers. Yet, recent events in October 2017 showed that even they can get caught out in considerable numbers under adverse conditions. The majority of stranded birds you will be found during March/April (the fledging season). Adult birds will have mostly left Kaikoura by this time, leaving their chicks behind in order to lose weight and get ready to fly out themselves for the very first time. It appears that our young birds on their maiden flights are more susceptible to disorientation as we observe much higher numbers of birds crash land during this time. Once on the ground, birds are unable to take off again. It is as if they cannot make sense of this unusual environment and just remain where they are. Waiting. They will need help to get some water under their feet and some wind under their wings to get going again. As such, they also won’t budge for approaching cars and can end up as roadkill. They also can’t get away from cats or dogs and fall victim to predation. Plus, left alone unattended they will eventually succumb to starvation. Most birds (except for those dying upon impact) have a good chance to survive if they get rescued, kept safe and released the following day. Read more about the phenomenon of fallout in Hutton’s shearwaters in our publication on “Investigation of fallout events in Hutton’s shearwaters (Puffinus huttoni) associated with artificial lighting” Notornis, 2017, Vol. 64: 181-191. Watch out for crash landed Hutton’s shearwater in the streets or on your property and assist in the rescue of these birds. Reduce speed when driving through Kaikoura at night or early morning hours to avoid roadkill. Keep your cats and dogs contained or on a lead at night to prevent predation. on 115 Ludstone Road, Kaikoura. 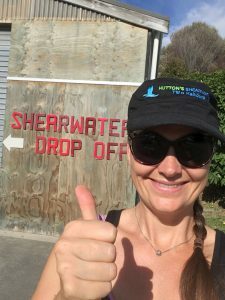 The Hub is a shelter adjacent to the Department of Conservation office; opposite the Kaikoura High School entrance on Ludstone Rd; behind the big DOC shed (follow the signs). The Hub is open 24/7. Here birds can be kept safe in wooden boxes (“Hutton’s Hotel”) from where we will examine and safely release birds back to sea. If all wooden boxes are occupied, please use one of the pet carrier boxes provided in the shelter and place underneath the ‘Hotel’ boxes. Record your rescue in the ‘Hutton’s Shearwater Rescue Log’ provided at the Hub. If you are unable to drop off the bird straight away, keep in cardboard box in a cool and dark location; DO NOT water, feed or further handle the bird. 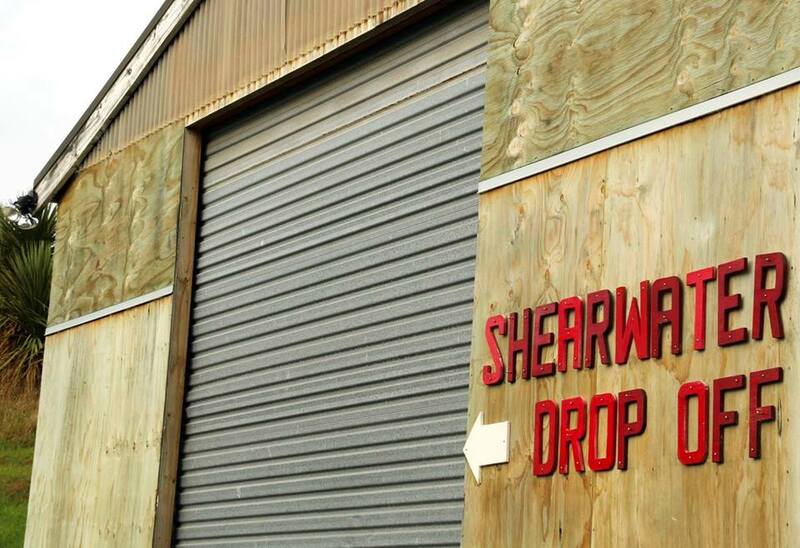 Please use the Hub as the single drop off point! Encounter Kaikoura and Whalewatch (places used in the past) do not have the facilities to hold many birds or receive them at night, while the Hub is operational day and night. Like this we can also make sure that the birds are in good condition and don’t need further attention before release. It also helps us to keep track of the number of birds crash landing per season and the opportunity to band birds to be identifiable in the event of recapture. During FlySafe (March/April 2019) there will be a labelled crate to hold injured or unwell birds at the Hub until further examination in the morning. You can also call the DOC Renwick office (03 572 9100) or DOC hotline (0800 362 468) in order to arrange potential handover of native birds to Kaikoura Wildlife Rescue. Vetcare Kaikoura (03 319 5693) are also a port of call, kindly offering assessment and potential euthanasia for severe cases free of charge. If not crushed or flattened on the road, you can pick up dead birds and leave at the Hutton’s Hub in the ‘dead bird bin’ next to the Hutton’s Hotel boxes. Please don’t put into wooden boxes which we want to keep free for live birds. It is advisable to wear gloves or use plastic bag to pick up bird. Unable to drop off at the Hub? If you cannot deliver the bird to the Hub, ring the HSCT on 021 351 355 for assistance. 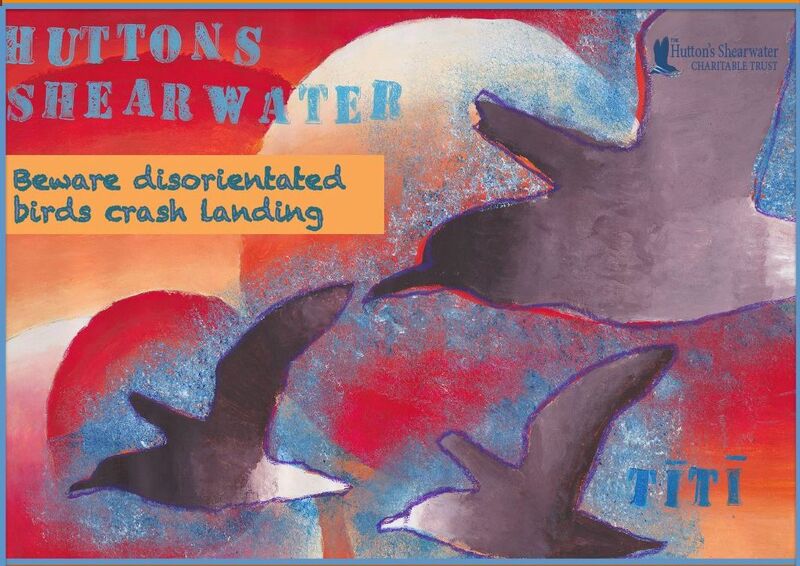 Take the bird to an undisturbed part of the beach or a wharf and release onto the water. From here it will know what to do (dive, swim or fly off). Please ensure calm conditions at the release site. Please do not throw birds up in the air as they might not be able to catch the right draft under their wing and crash again. If you are inland, place the bird in an exposed place like a ridge or mound where it can face in the wind and take flight again. (Please do this only if no other option available). 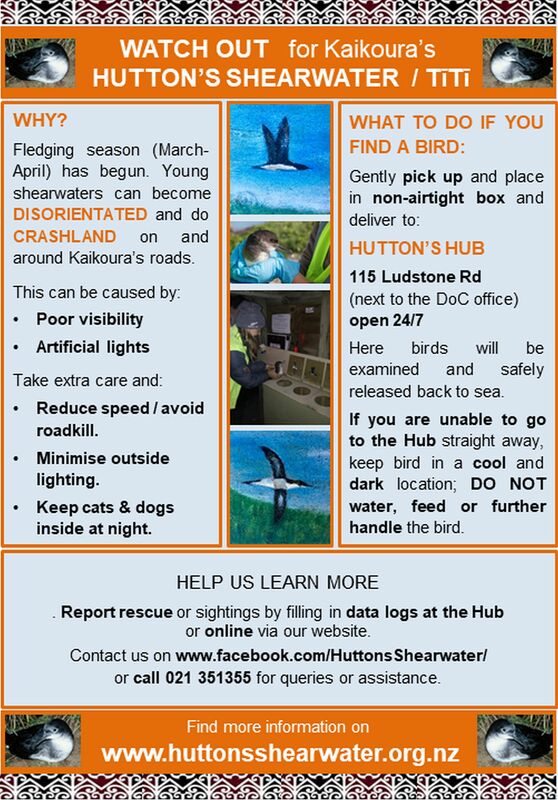 Report your sighting / rescue to admin@huttonsshearwater.org.nz or fill in our online Hutton’s shearwater rescue log here. How to pick up a bird? Approach bird from behind and not up front. Place your hands around the bird so you do contain its wings. You can use a towel to carefully put over bird before you pick it up but remove towel once you placed the bird in a box. It is advisable to have cardboard box and towel in your car at all times during breeding and fledging season September to April). Make sure conditions are safe before you pick up a bird from the road. Drivers: be aware of traffic around you when braking or pulling over for a stranded bird. REDUCE SPEED at all times when going through Kaikoura. This is what will keep both you and our birds safe! Wear gloves or disinfect / wash your hands after handling birds. The occurrence of fallout in relation to artificial lights has been observed in many bird species. Among seabirds it appears to be particularly apparent in nocturnal species, where birds commute to and from their nesting sites / burrows at night, like the Hutton’ shearwater. Together with researchers from the University of Canterbury, the Trust is working toward understanding the factors which may cause birds to crash land here in Kaikoura. We also try to determine what proportion of the population is actually affected by this and how many birds die per year. 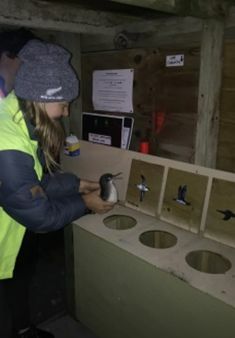 Findings from these studies will support the development of mitigation measures (e.g., upgrading existing lighting networks to more seabird friendly applications) in collaboration with Kaikoura District Council. We will need your help to collect data! Please report sightings or rescue by filling in logs at the Hub or send an email or photo incl. date, number of birds and location to admin@huttonsshearwater.org.nz. You can also download a data log sheet to print out and keep recording and hand in later or fill in our online rescue log here. This year during FlySafe (March/April 2019) we are also trialing a data recording app among our night patrol volunteer teams. If you want to become involved, you can register your interest here. During fledging season (March to April), when young and unexperienced birds become grounded in and around Kaikoura almost every night in varying numbers, the Hutton’s Shearwater Charitable Trust (HSCT) is promoting an increased awareness programme via the FlySafe event to encourage maximum input from the Kaikoura community and visitors, enabling the collection and release of as many crash landed birds as possible. Procedures for rescue and release are as described above. You can find this year’s event posters here.